Water filters are incredibly important to our health. Drinking water is so natural in a lot of cases that most people don’t think of what is in the water that is slipping its way into our bodies without seeing them. Read Why you Need a Water Filter. Before you go out and buy a random water filter for your home there are a few questions that you should be asking yourself if you are on municipality treated water. Is your water fluoridated? This is a controlled addition of fluoride to a public water supply to reduce tooth decay.Do they also add ammonia changing the chlorine to chloramines?You can call the number on your water bill to find out the answers to these questions or you can do a search for your city and state annual water quality report. At FriendsofWater.com all kitchen filters are available in undercounter versions – readily installed by a plumber, and countertop versions, where no plumber is needed. 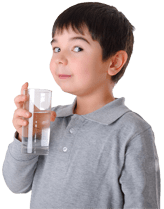 Go to the FriendsofWater store to see all fluoride water filters, including those that target chloramines and pharmaceuticals. Stop drinking harmful chemicals now. FREE SHIPPING on all fluoride water filters. FriendsofWater.com guarantees everything we sell. If you aren’t satisfied, you can take up to 90 days to return any product for a full refund. For a guide on how to select the right kitchen filter for you, see this page: How to Choose the Right Kitchen Filter. If you need more help, Contact us. If we don’t respond immediately, we’ll get back to you very soon.